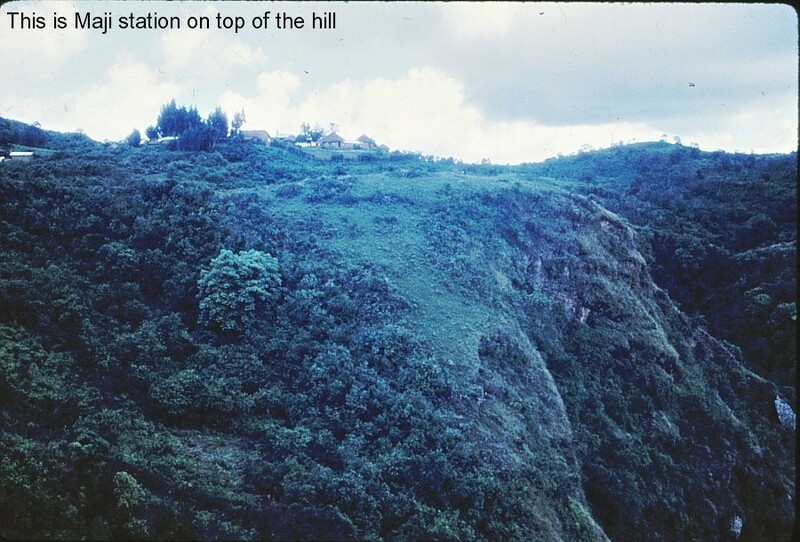 On that complicated and scary ride from the savannah up into the mountains, there was one spot that was scarier than scary, and I can still remember the nightmare I had about it when I was about nine years old. What should be scary about a road, you ask? Well, the Jeep broke down regularly, which made for heart-rocking drama as we stood by to see if this time would be the time Daddy wouldn’t be able to get it going again. My dad regularly hurried out to rescue stranded travelers. No one was around to hurry out and rescue us if this was the time. But the scary, scary, scary place was called nifas bir. Gate of the wind. My sisters and I called it Down on Both Sides. (Yes, another spot on the road was Up on Both Sides.) 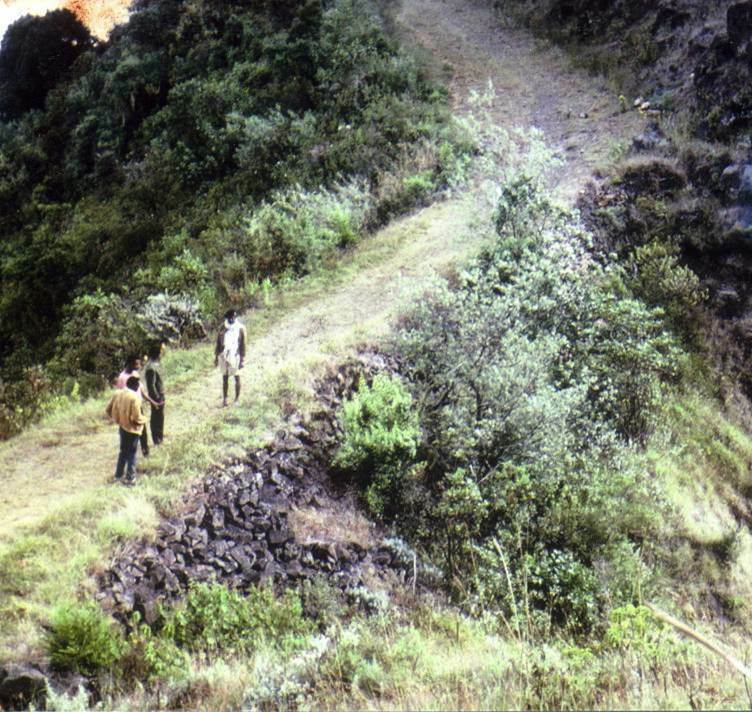 If you were to tumble off the road at that spot–as my dad did in my nightmare–nothing would stop the fall. You’d just drop thousands of feet to the valley below. My dad liked to tell the story of the time he came around the bend and saw a leopard sunning itself on the rock. That story added the last bit of shiveryness to nifas bir. You don’t think wind is scary? I’ve lived in more than one state in the Midwest where the sky turns weirdly green and the siren rises weirdly up up up and you trot yourself down to the basement to sit until the warning is done. Wind can whirl and lift and smash. But my nervous feelings about wind go all the way back to the time the wind was whistling in Maji and I was watching my dad up on the roof of the house in this picture, trying to keep chunks of the grass from blowing off. In my mind I saw, over and over, the wind lifting the tarp and my dad up, up and sailing him into the valley below. cozy. Even when I was sitting by the snapping wood fire in the house, I might be listening to the faint roaring outside, wondering if it was Daddy coming back in the Jeep or just the wind rocking the branches in the cedar trees. 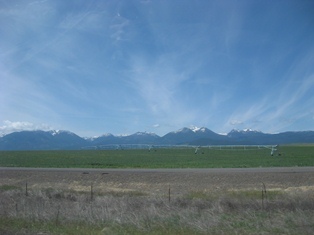 On our trip west last week, I saw wind farms in every state. 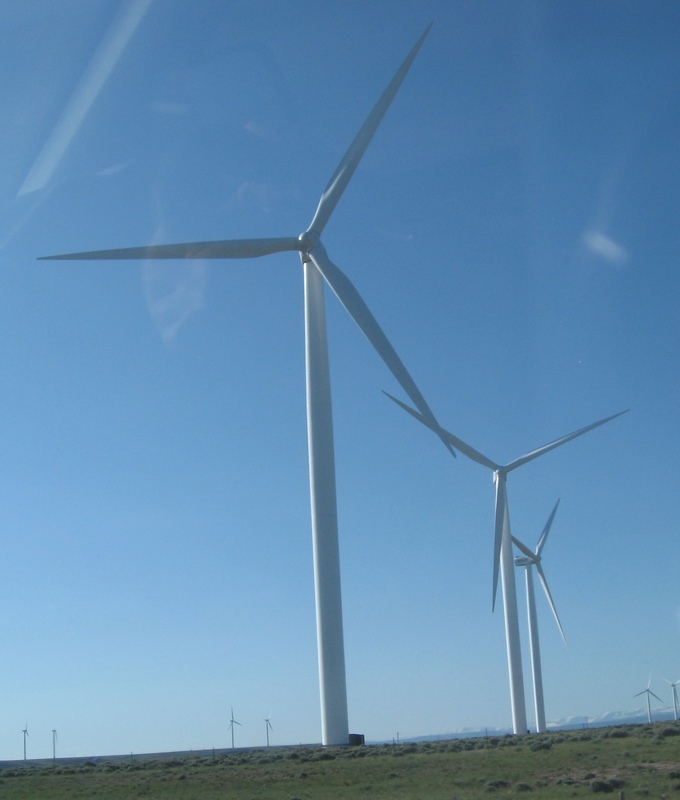 Living in North Dakota, I often listened to wind that seemed to start in Texas and rustle, howling, all the way up the Great Plains with nothing to stop it. Now that powerful wind is caught in the blades like this and somehow turned into megawatts of electricity. And life all fragile in the middle of it all. Only when I travel do I tend to remember the role that clever, well-planned, well-designed infrastructure plays in getting us the things that matter most in shaping the good life: food, water, work, stories, and the like. 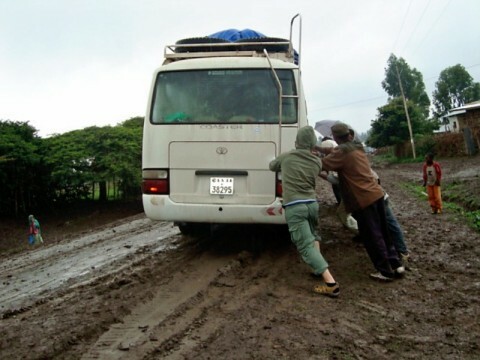 Traveling in Ethiopia often has the zing of adventure. I’m thinking today of my brother and good friends who are there right now and (I think) soaking up the joys of an eco-lodge that got high marks from the Fulbright Hayes group of educators who stayed in Yirgalem last summer–after hard days on the road. Hard travel sometimes makes for a great landing. And great stories. 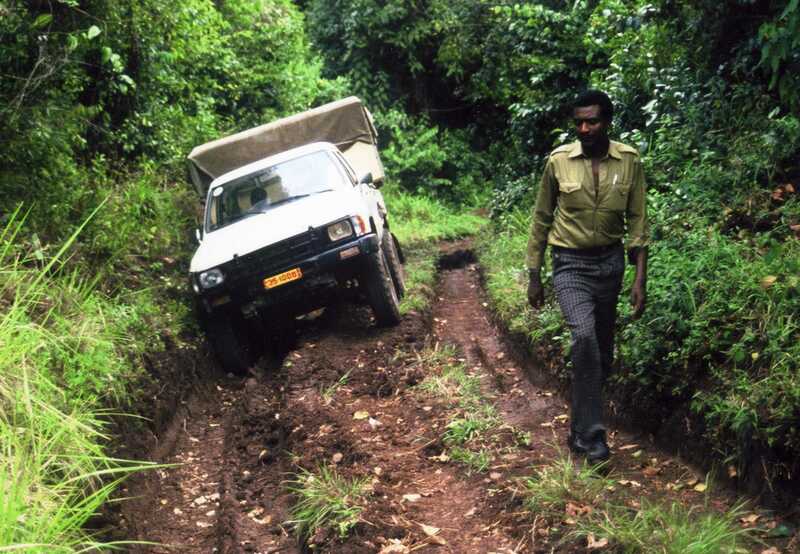 When I was a kid in Ethiopia, the road from the savannah up up up into the high and beautiful Maji mountains created breath-stopping adventure. On one short stretch, my sisters and I would stand and let the wind blow our pony tails and scream, “Super highwaaaaaay.” Other times, the Jeep crept so slowly that we could hop out the side and walk for a while. Except for the most local travel, though, we moved place to place by plane. One day someone pointed out that for many people in Ethiopia, the first glimpse of a wheel was one attached to an airplane. Getting goods and services–including ideas and books–to the places where you want them to go requires a lot of planning. A lot of asking hard-headed questions. A lot of letting-go of assumptions and old rhythms. Things are gained and things are lost as we shrink the world efficiently. It’s easy to treat fellow human beings and animals as the pawns in the scheme…or as the things in the way. Read the stories of the enormous push of transcontinental railroads, and you’ll know what I mean. My drive from the Midwest to the coast last week made me think about all of that. Trains still snake across the prairies. I listened, as we drove, to a radio report about how Chinese engineers may well be the ones to come in and design high speed rail systems–ironic, of course, given that Chinese workers laid so much of the rail we still see as we drive through the western states. The landscape of the drive had so many greens : Christmas tree green and lily pad green and garbage can green and the green of a lemon peel that hasn’t quite gotten the message that it should be bright yellow. In places, the delicate gray-green or silver-green of cottonwood trees or sagebrush blends with rocks and grass of beige and tan, painting a paleness that stretches all the way to the horizon and smushes up against the…well…have you noticed the sky in these pictures? 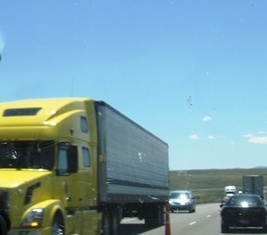 In that vast, pale world, it’s startling to see the crayon-bold reds and blues and yellows of so many of the trucks that trundle along in the opposite lane. Sometimes that lane seems scarily close. 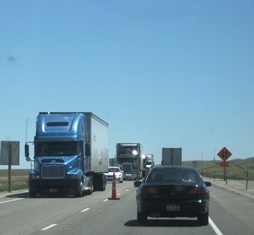 Summer time, after all, provides the months when much road work gets done. My grandma’s grandma was a little girl when her family set out on the Oregon Trail in a covered wagon. 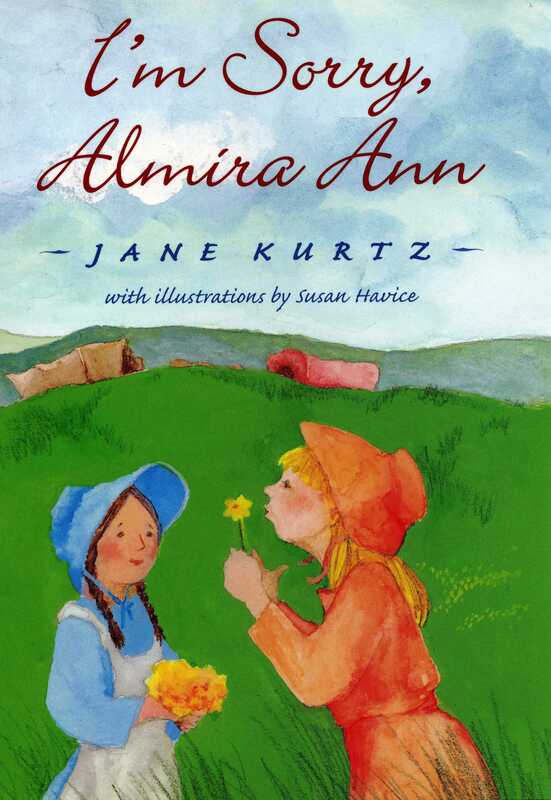 Like a lot of people, I’ve long been fascinated by my ancestors’ experiences, and when I wrote I’m Sorry, Almira Ann, I wove in a true story from that trip. Seems when the wagons creaked to a stop one noon, my grandma’s mom began to make bread for the family, but the dough was sticking to her wedding ring, so she took off the ring and slipped it onto the branch of a bush. Many hours later–as the wagon wheels jolted over the rough earth–she looked down at her hand and realized her ring was still on that branch. Ever since I first heard the story, I’ve been able to hear the wind rustling through the grasses and see that ring glinting in the middle of the yellow-green prairie. Last week, as I drove from Kansas to Oregon, I thought (especially when the trip grew tedious) of what it must have been like to get up day after day, for months, and inch across that ground. For a while, pioneers had the Platte River by their side, just as I did. “Too thick to drink, too thin to plow,” they decided. This year, Nebraska is eyeing with alarm that wide, flat river (and the Missouri River, from where it flows). The trip west in those days had to be timed carefully. Leave too early and you might not be able to find enough grass for your animals. Leave too late? Watch out for the snow. The trip was pretty much organized around water. All across Wyoming last week, we drove for hours through places where rivers run, where the travelers saw and still see the mountains, so tantalyzing, in the distance. Sometimes the mountains look close. Almost there. And you drive and drive and drive but they get no closer. And then one gets to the dry stretches. Parts of Utah and Wyoming look like a giant, at some point, played with muddy sand, letting it dribble and drip. Those were the thirsty, dusty days for pioneers. Oxen and mules, people and puppies limped on, longing–no doubt–for the days when the wagons were lumping along beside the Platte River. Growing up in Ethiopia, I saw what it’s like to be in a community that doesn’t have access to easy water. We turn the tap in our modern American houses and out it spills. Only every once in a while, we pause to remember the burst of joy that cool, fresh water brings into our lives. Eastern Oregon, where my family stopped their Oregon Trail journey, is a place short on water. The farm where my father grew up wouldn’t have existed except for the Owahee dam, and it can be a dry, harsh place. My dad remembered the year when his family planned to have a sagebrush Christmas tree–except that a teacher offered to sell him the school Christmas tree for ten cents, which he proudly carried home. In the rare times when we left Ethiopia and spent time in eastern Oregon, one of my strongest memories is of wading in the cool of the irrigation ditches. I heard the whispered stories of the cousin who drowned in one of those ditches. Water, wind, earth and fire. Life all fragile and sometimes lost in the middle of it all. 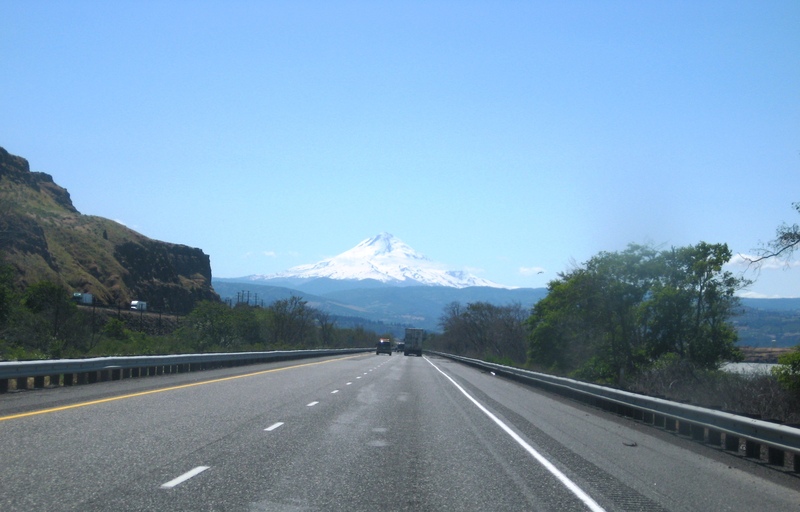 When Mount Hood finally looms ahead, it looks close. Surely the trip is almost over now. But the road flows on and on and on. So hard to remember that each step, step, step IS the story. So hard not to blur out the trip and long only for The End. I didn’t expect to grieve when I left Kansas. Kansas was fine. I like Kansas. 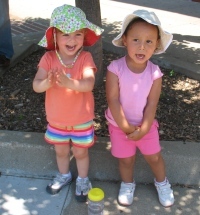 We moved there to live close to Leonard’s parents at the end of their lives–and then we moved to Lawrence to add some hands into the pot for Jonathan and Hiwot while they were juggling classes at KU with the leapings and cavortings of two preschoolers. I knew from the beginning Kansas would be a place to alight for a while, then fly on. 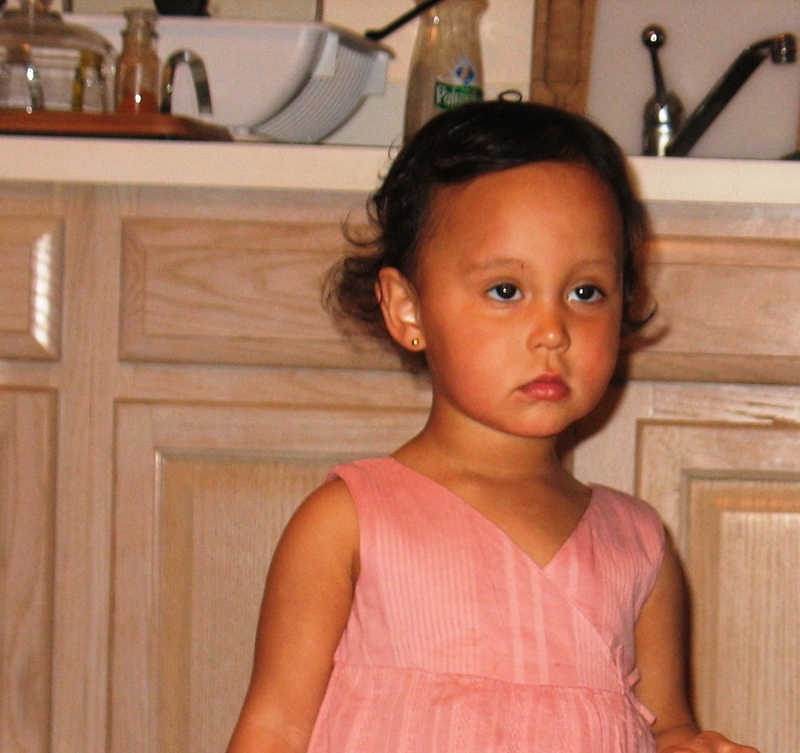 But big chunks of my emotions and memories got hooked while I was there, including happy and sad grandbaby days. 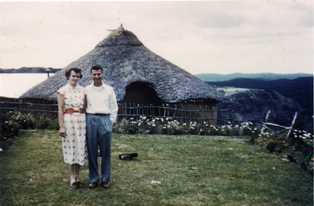 I was born in Portland, Oregon, but my parents left there when I was only two years old and moved to Ethiopia. 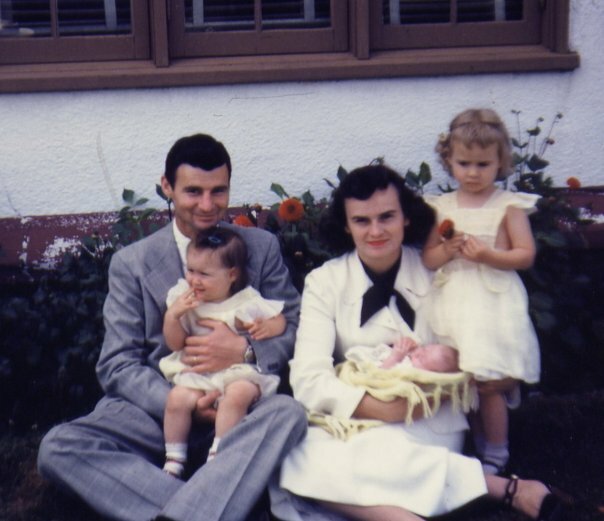 (I’m the charmer on my dad’s lap in the picture.) Now my mom is back in Portland–along with four of my siblings and their families–and I’ll be living here for the first time since I was in diapers. When I drove out to Portland to look things over this week, I never expected to feel so melancholy driving across Kansas, looking out at the fields, thinking about last week’s trip to say goodbye to Dian Curtis Regan, author buddy. Of course I’ll see her at writing retreats in Boston area. But I’ll miss seeing her in Wichita. I’m not quite sure why in this picture Dian is pretending to strangle Clare, her good writing buddy, but we had such a great time talking about writing, friendship, and what it was like to get The Call. Right now, Dian and Clare are heading to ALA in New Orleans for one of the most zingy experiences a children’s book author could ever have–to celebrate Clare’s Newbery medal for Moon Over Manifest. It’s a rare, rare thing indeed for a first novel to win such a career-changing award. I think it has only happened once before since the award was established. So wow! Wondrous celebration time for all Kansans but especially Clare and Dian. How is it that celebration and grief get woven together so tightly sometimes? How can grief jar me in such surprising ways? 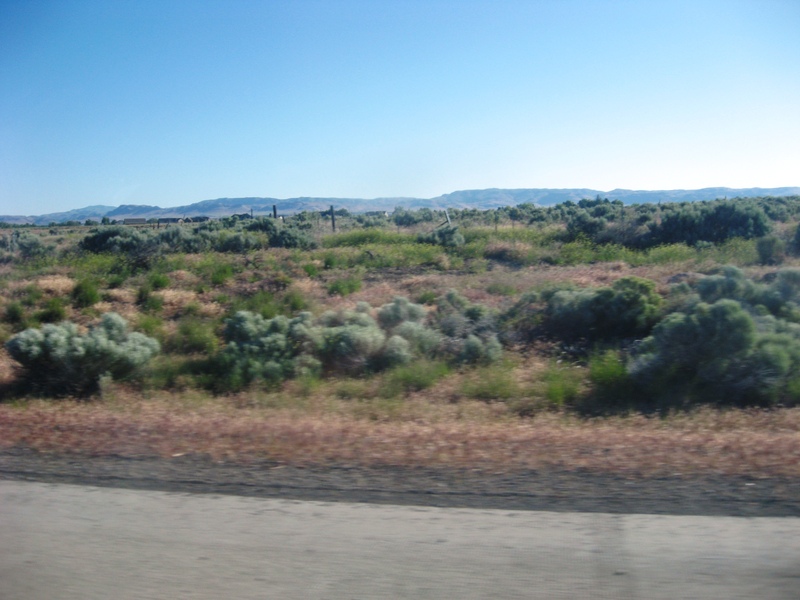 I didn’t expect to creep up toward western Idaho, cross the border into eastern Oregon and feel such a whomp of memory and sadness about losing my dad, who grew up in those sagebrush hills. When we arrived there for our first family visit, five years after leaving for Ethiopia, my dad’s swimming hole was where we huddled and asked, “Are there crocodiles?” He saw for the first time the chasm he had dug between his childhood and ours. I would have said I had no deep connection with that spot of geography. Seeing the signs, the names of places that shaped my grandparents and my dad, my cells responded. Stories are the way we connect the dots, as one of the books I read on the trip points out. 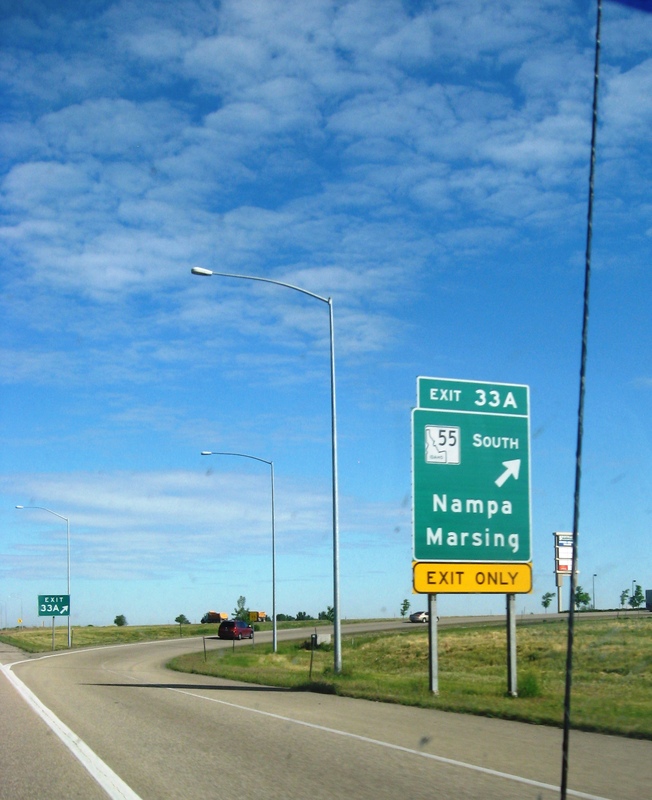 Stories of eastern Oregon and my dad’s childhood tangle together with my few visits there and make those towns more than names on a sign. We choose to believe (or not) that our actions on this earth can be significant and meaningful. We show our children by our actions the things we truly care about and want them to care about, too. The webs spin and on we go. Grief and adventure are part of it all. One of my ancestors–Hezekiah–arrived in that part of Idaho-Oregon and came upon a group thrashing grain or something by the river. Sure they could use another pair of hands. “What’s your name?” someone asked. So we re-invent ourselves as we move. Thanks, Grandma Kurtz, for always being open to learning, to re-invention, to a hearty laugh at the stories of life. I grew up around kids who were hungry to be in school. For a lot of them, it was a dream that would never happen. 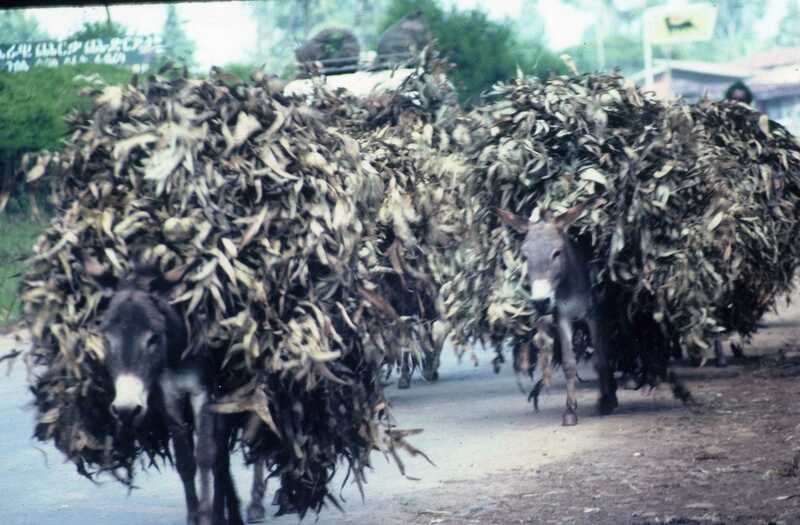 Some of them didn’t have even a few coins to spend on supplies. My dad saw a boy herding goats by the path and told him, “You should be in school.” The boy told my dad he didn’t have those few coins he needed. He asked for work in my dad’s garden. “You’re too small,” Dad said. Many years later, my dad was talking to his garden helper, now a teacher. “Aren’t you glad I spotted you by the path that day and encouraged you to go to school?” he asked. 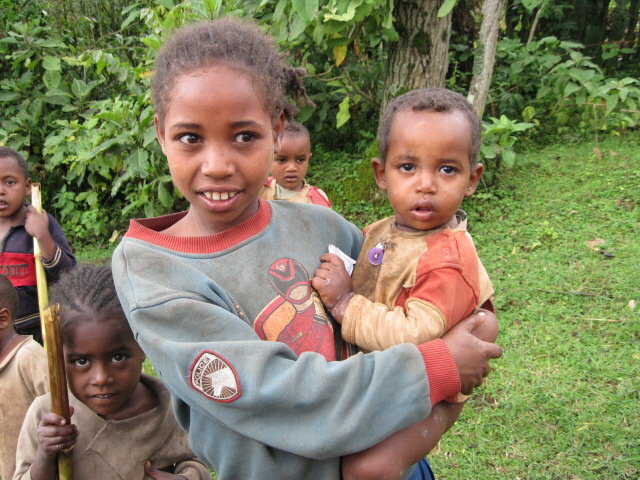 Kids in Ethiopia. Whew. So full of everything that children are. ‘You! You!” they call as they run up, eager to try out their English and giggle. What they ask for most often is a pen. Some of them will never go to school because they’re too busy taking care of younger siblings or carrying water and wood for their households. 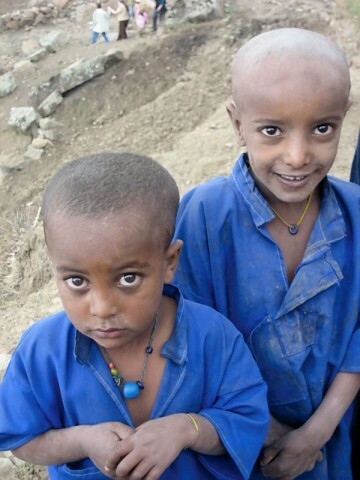 But thousands more are in school, today, than when I was a child in Ethiopia. In Maji, I learned to read. I learned to love books. 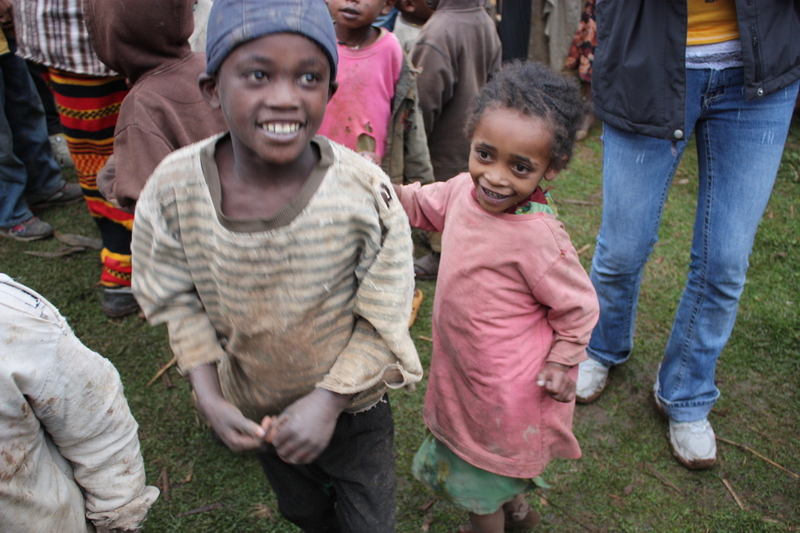 I long to get books to more of those kids who are in school in Ethiopia now. When my mom was a girl, her mom found her sitting on the porch crying. “What’s wrong?” she asked. My mom left home as a teeanger, determined to get herself to college. At Monmouth College in Illinois, she met my dad. She’d only managed to get in two years of college when she taught me and my sisters to read–but her love of books and school spilled over to me and shaped my life. Everyone should be lucky enough to learn to read from someone who loves to read. Here in Oklahoma, I spoke to a class taught by a librarian who knows that. We talked about how many schools are forgetting to make time for the joy and passion and thrilldom of reading. 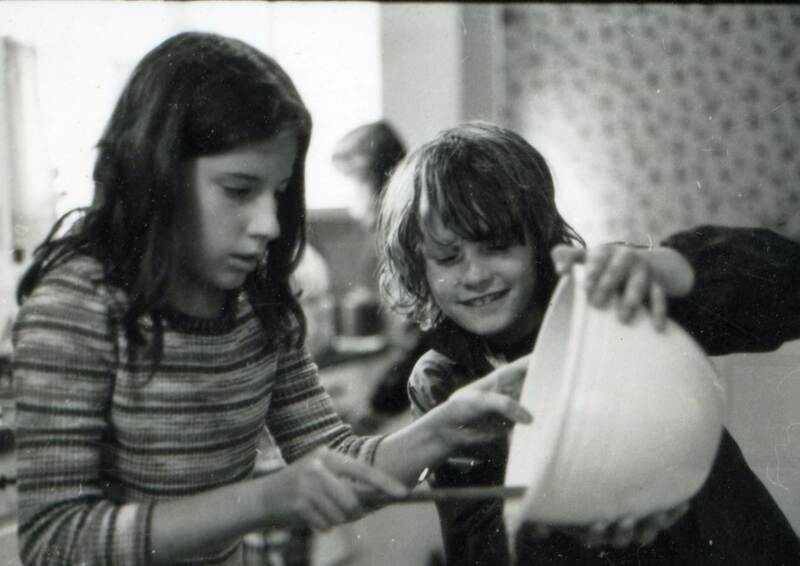 When I was a young teacher and these were my students at Carbondale New School, so many parents and educators were trying to figure out how to make U.S. schools places where kids dug in and tried things, got out of their desks, stopped filling in blanks on pieces of paper and thought and talked and explored. It’s baffling that education has swung back toward filling in the blanks. 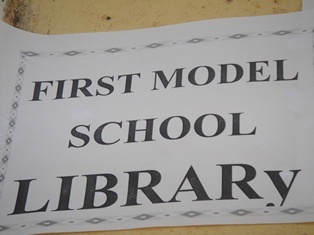 Right now, Ethiopia Reads (www.ethiopiareads.org) has more than half the money raised to put a library in this school. The sign is boldly up. 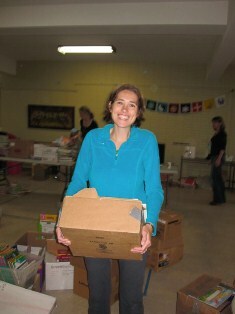 I can’t wait to see what the teachers in this school will be able to do with books. I just know we’ll raise the rest of that money soon. “Don’t you get tired with your teaching load and writing and speaking and all your volunteer hours?” someone asked me here. But I never think TGIF. I wake up every morning wondering what excellent news the day will bring. I love, love, love what I do. I just about can’t stand the thrilldom. Who’d have dreamed when I was watching the kids around me in Ethiopia run toward school, toward books that I’d some day have an Ethiopian-American granddaughter who would read my book, based on my memories of the Ethiopian savannah (Water Hole Waiting) to her brother? Couldn’t have made it up! 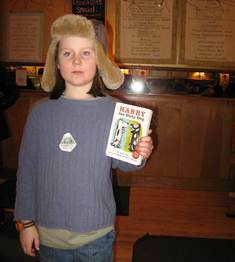 Yay for schools in the U.S. that fill kids with a passion for books and learning. Up with the teachers who know how to do that. Their voices often get drowned out. 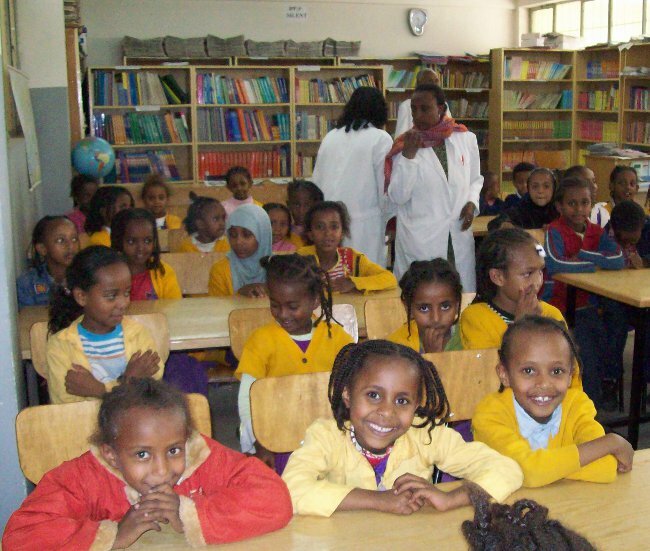 Up with the rippling of reading and deep learning to Ethiopia and all around the world. Come on…we can do it. This reader brought a book with him to the Boston coffee shop where he was planning to have a cup of hot chocolate with me while his mom and I talked. I’d just done an author visit in his school. I’d talked about the power of words. Reading them. Writing them. Listening to them. I’d talked about growing up in Ethiopia and now getting to see kids reading in Ethiopia, thanks to my volunteer work with Ethiopia Reads (www.ethiopiareads.org) His school, Haggerty, had raised $502.00 to donate to Ethiopia Reads as part of their “peace begins with me” assembly. He speaks for hundreds of us who love our books and National Geographic magazines and who long to share them with young readers in Ethiopia who are fiercely hungry for reading material. But easier said–as the saying goes–than done. 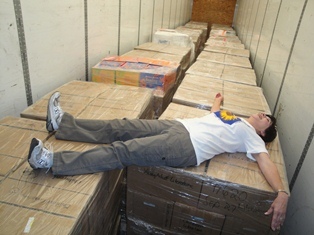 Getting those books to Ethiopia involves pallets and tractors and forks lifts and storage units. Moving day may land on a Kansas afternoon when the temperatures are in the 90s. It takes getting bids and juggling possibilities and finding organizations that are willing to let someone else use their equipment–because they’ve (amazingly) caught a tiny bit of the dream. It takes (no exaggeration) years of time and hours and hours given by volunteers, mailing and sorting and sifting and hauling and lugging and packing books into boxes. pieces of the puzzle are moved into place…every bit of moving and shoving and manipulating done by volunteers and a few over-worked, idealistic staff people in places like Denver and Atlanta and Minneapolis. It takes a driver like Craig. 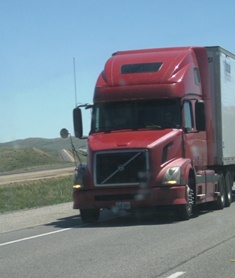 He pulled up with his semi and viewed all the pallets with a certain amount of skepticism. LeAnn and Stan assured him everything had been weighed, but he still was sure they had too many books. He was pretty sure that after he left the storage area, he’d be back. LeAnn was equally sure she had it right. She’s managed these shipments before. and she wasn’t letting anything tangle-up this day so long in the making. She’d be the first to say she can’t do her volunteer work without the help of lots of other people. long line of people who touched these books and pallets and boxes to get them to this point. She represents the faith of Kansas Reading Association who listened to LeAnn’s dream and helped with the very first container she shipped. without Stan. He’s the one who understands the equipment. He’s the one whose co-worker showed up to help lift and lug and haul in the 90+ heat. Did Craig have to come back and unload some of the books? But they will get to see the children whose lives will be changed by the chance to read a book. And they’ll get to talk with and listen to the educators who will be in charge of putting those books into the hands of the children. And they’ll get to think, with the Ethiopia Reads staff, about how to keep going. How to work harder and smarter on this project. 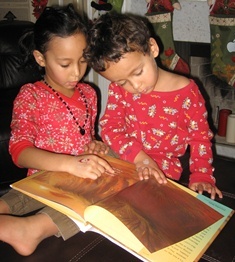 How we can do our humble best to be good teammates in the big push to make literacy a posibility everywhere in the world–where families want the very best for their kids and where countries are going to need thoughtful, resourceful problem-solvers for the coming years. Good, deep education will give those kids a lot of power to figure out how to solve problems. One thing I love to see in my travels is the way kids in this country–who also need to be thoughtful, resourceful problem-solvers–come to recognize their power, too, through the Ethiopia Reads projects they do. Every container seems to represent an impossible task. Triumph. New libraries. New stories sent whirling on their way.